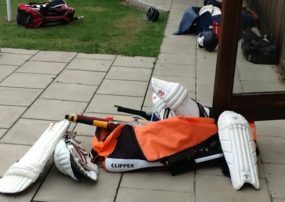 Wednesday, July 15th, had us play a hurriedly put together 20-20 game at Stapleford. Last minute it may have been but we still managed to deliver a very good team and a comfortable win. A better than 50 opening partnership between John Anderson and Don Syme pointed the way to the 150 total that our hosts were never likely to get. Sam Ludford then ruined the game as a contest with three wickets in his opening three overs. Friendly Grantchester bowling went on to allow the hosts to reach 100 as their innings ended. Stapleford are in their first season back after the club ‘went under’ some years ago. Their cricket may not yet match their excellent team spirit while post-match conversation in the nearby Three Horseshoes suggested they’ve a future. We may learn next season how far they’ve come. from our roving correspondent a.k.a. t.k.